This is a summary for Brinley’s 22nd week. She was 21 weeks old. Brinley turned 5 months old this week. Nursing continued as normal. I am nursing her five times a day. If I follow the same pattern I did with my other kids, I will move to nursing her four times a day at some point. I like the schedule we have going on right now and don’t mind the five. I also like five because I like having that extra feeding to help ensure milk supply stays sufficient. Some moms need to stick with five for milk supply–I haven’t ever been that way, but I feel more secure with five. This week, we added sweet potatoes to Brinley’s menu. She is just “eh” with them. She is interesting with her solids. The first time she tries them, she eats them without making much of an expression at all. She will even go a couple of days eating them just fine. Then she gets to a point where she decides if she really likes them or not. Sweet potatoes are just okay. Some days she likes them more than others. I made them from scratch and I microwaved them…which honestly I have decided is a bit gross. I think they taste much MUCH better baked, so the next batch I do, I will be baking them for her. I sometimes mix her sweet potatoes with bananas (a good combination–the compliment each other) and she then likes the sweet potatoes much more. Naps were perfect this week. She is almost too big for her bassinet. I estimate she has a month or two left before she is too big to fit in it comfortably. So I started the process of weaning from the bassinet. I had her take her last nap of the day in the crib. Brinley was really the portrait of perfection this week. She slept for all naps perfectly, ate perfectly, slept through the night perfectly, and was perfectly happy and content all day every day. I have learned, as I mentioned in the past, that these weeks of perfection are typically the “calm before the storm.” They seem to precede a wonder week. Hi 🙂 My daughter was born August 9th, 2012, so she and Brinley are close in age. We started solids over the Christmas holiday. At this point, we are only doing it once a day (after I nurse her first thing in the morning). I can barely get her to take 1 Tbsp and it takes forever. She doesn't seem very interested. Not opposed to it either, just not gung-ho. I tried some butternut squash (baked, homemade) to see if she would be more interested. She seems to like it a tad more than the cereal, but still not eating much. Perhaps she is full since she just nursed? I thought I was supposed to nurse and then follow it with a solids feeding. I would love your thoughts. Love your blog! Emily it might be the time of day. You will have the most milk in the morning, so she might do better around lunch time or dinner time.She also might not be ready, OR she might just not really like cereal or squash. I just gotta say that is a CA-YUTE! 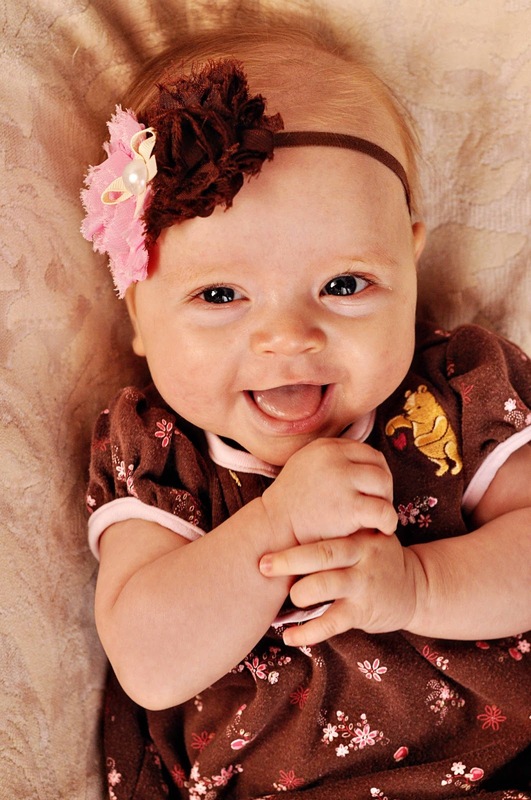 picture of Brinley. So adorable. That is all. She is so precious! Love seeing the pictures on her weekly summaries. Thank you, Valerie! That is a good thought. I spoke to some people at work who have babies around the same age. Their babies like oatmeal better than rice cereal. That never occurred to me to try oatmeal and I see that you also use it! We are going to try the oatmeal instead.Your Brinley is adorable! Hi Valerie, I have to say I just love reading your blog. My daughter was born a few weeks after Brinley and I love following along and seeing what I have to look forward to! My daughter is 22 weeks (today!) and is having nap problems. She goes to bed at 7:30-8pm and wakes up at 7:30 in the morning. She doesn't STTN yet, she wakes up once around 2-4 for a feeding and I'm honestly fine doing that. Although, I just started solids so this midnight snack will be stopping soon! As for her naps, she takes her first nap at around 8:20 and wakes up exactly an hour later. She is happy and giggly when she wakes up so I don't make her sleep more. At 10:30 I nurse and give her solids/oatmeal. Then she's tired pretty soon after that so I put her down and once again, she sleeps for an hour, waking up happy. This is where our day goes south as this is the last good nap! She refuses to nap the rest of the day. I can usually get a half hour here or there until her bedtime at 7:30. I've moved her wake time all over the place trying to trial & error the problem and I just don't know anymore. I have wondered about moving her to a 4 hour schedule since she's 5 months but I'm not sure about that either. I would really appreciate any input you have. I enjoy your blog immensely and will continue to look through previous posts to see if I missed anything. Thanks so much! Hi! I would love to hear what you say to chelseaanne green as my daughter who is a few days from being 5 months and does te exact same thing. She is also way more active than my 20 month old ever was and doesn't stop moving lol my daughter will only sleep an hour on the dot and every once in a while she'll sleep for an hour and a half. I've started solids with her and she's eating 3 times a day plus nursing every 3 hours (sometimes sooner because she wakes up an hour before her feeding). I've tried everything so I would love some advice as well. She also still doesn't sleep through the night but is only waking up once now and then wakes at about 6:30am talking and happy as a camper, just as she is waking from her naps. Thank you for any help you can give! I noticed that Valerie hasn't replied, but for the sake of anyone else (I'm sure both of your troubles have passed with the time lag), I'll share my experience. My 5 mth old does the same thing. I have found that although he wakes up happy and energetic, if I reswadddle him and hod him for 5-10 minutes (just repeating our sleep time routine) he will go back to sleep and complete a 2-2.5 hr. Nap. Hope that helps someone!